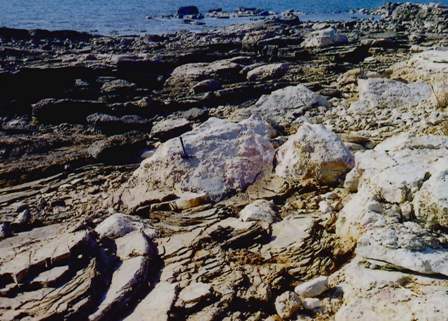 Remains belonging 10 sauropod dinosaurs have recently been discovered in Upper Hauterivian/Lower Barremian (Lower Cretaceous)limestones of SW Istria (Croatia). The material consists of a completecervical vertebra, a nearly complete cervical centrum, fragmcnls ofposs ible cervical ribs, three partial dorsa! and five more or less incomplete caudal vertebrae, parts of caudal neural spines, a chevron,the distal pari of a femur, the proximal portion of a tibia and otherfragments of bones. The bones were collected randomly from the seabottom, therefore despite the fact that they come from the same outcrop, the same level and probably the same bed, they cannot beassigned with certainty to the same taxon. Their vastly different sizesindicate the presence of several individuals while different morphologiessuggest the probable presence of more than one taxon. The completecervical and the anterior 10 mid-caudal vertebrae present a morestrict affinity with Brachiosauridae, a proximal cervical centrum resemblesthose of "Cholldros(eosourtls", and a caudal neural spine is similarto those of the camarasaurids. The dorsal vertebrae have peculiarfeatures (a very tall neural arch, well developed laminar complex,etc.) and characters suggesting their assignation to basal Titanosauriformes and, possibly, to Diplodocimorpha. A posterior dorsal vertebra testifies the presence of a new Diplodocimorph similar to Rehbachisollrlls but more primitive.